It is with mixed emotions that as a family we announce the passing of Mary Prebushewski (née: Stachniak) on Thursday, March 14th, 2019. Heartbroken to have her leave our earthly world and no longer accompany us in our daily lives, yet comforted to have her pain and suffering finally end, but still have her vibrant spirit live with us forever. Mary was born August 17th, 1932 in Prud’Homme to John and Anne Stachniak, growing up on the family homestead near Smuts, SK (I just love saying that name). She was fortunate to have three sisters and four brothers: Rose, Olga, Vicky, Tony, Joe, Mike, and Bob. Sadly they all passed before her, leaving her the last of her family, a title that she really didn’t want. Mary attended University of Saskatoon, receiving her nursing degree. Her profession brought her to Moose Jaw where she worked as a nurse with the Providence Hospital until her retirement, and then carried on to do private Palliative care work. Mary loved her job and was very dedicated to the profession. While working in Moose Jaw, she met her husband to be, Joseph Prebushewski, and they were married on June 13th, 1959. They brought six children into the world: Ken, JoAnn, Rob, Nick, Kevin, and Chris. With heavy hearts, Mary leaves behind her children: Ken, JoAnn (Steve), Rob, Nick (Pam), Kevin (Shawna), and Chris (Tami). She was also graced with 13 grandchildren, listed in the order of relationship to her children: Jessica (passed at birth), Brandon, Sean, Brian, Scott, Chad, Sheadon, Cody, Tamara, Brysun, Joey, Allie, and Josh; as well as 4 great-grandchildren: Jude, Callum and two with Scott. Mary had a very close relationship with all her nieces and nephews which transcended to their children, whom she cherished dearly. Mary had many friends throughout her years up to and including her days at Pioneer Lodge. At the lodge she met Ruth Tabin, who told the family that “She never had a best friend growing up, but knew Mom for 5 years whom she considered her 1st best friend”. It was Mary’s openness and honesty that brought such long lasting and deep friendships, including Diane Morhart, who was her best friend for over 40 years, and she loved her dearly. No age group will be left untouched by Mary’s passing as she was well loved by her children’s friends as well. Mary loved being outdoors, enjoying sun tanning and gardening, which included an assortment of real and fake flowers, each always made you giggle when you saw them. She was an avid cheerleader for her sons and grandchildren’s events. On occasion she was known to offer a toonie to the refs in hockey to buy a rule book. When coming to Mary’s home you were always welcomed with an open door, a great meal, and of course many drinks and laughs. She enjoyed card games, listening to music and dancing, including times in the garage parties. She had a great sense of humour and a quick wit. In her last few years trips out to local parks were a pleasure and she felt they were like a month long holiday. Mary liked to write poems and sayings, and picked up the painting bug during her stay at Pioneer Lodge. Mary left a note with her wishes that the family has followed and also said “Thank you for coming, love you all! Good-bye, love Mary”. The family would like to acknowledge the exceptional personal relationships she gained with members of the staff at Pioneer Lodge, which she truly enjoyed. Also many thanks to Dr. Sanderson, Dr. Webster and others that provided her such great care, and we can’t say enough about the personal attention and care given by the nursing staff at the Dr. F.H. Wigmore Regional Hospital in Moose Jaw to both Mary and her family. It’s difficult to summarize in a few words the Mary we all knew and loved. She may have not lived a grand life, but each small event was monumental and filled with love. The Funeral Mass will be celebrated on Tuesday, March 19th, 2019 at 11:00 a.m. in St. Joseph’s Roman Catholic Church, 1064 3 Ave NW, Moose Jaw, SK. Father George Thattuparampil will be the presiding celebrant and interment will take place in Rosedale Cemetery. A Prayer Service will be held on Monday, March 18th, 2019 at 7:00 p.m. in Moose Jaw Funeral Home. Arrangements are entrusted to Moose Jaw Funeral Home, 268 Mulberry Lane. James Murdock, Funeral Director 306-693-4550. Will miss Aunty Mary so much she was so kind and loving, I enjoyed many visits when I would come home to visit. I had a lot of great memories growing up. Love and miss u always. My wife Olga and I James want to offer our sympathy to the family. Also we want to offer some comforting words from God,s Word the Bible, that one day our creatour promises all thinks will be new. Revelation 21: 1- 4. Mary was a special person. Such a character. I had so much fun at her home garage sale (with or without refreshments) lol. Got to know her so much better when Pat was recuperating at Pioneer Lodge 2 summers ago.. We spent many afternoons each day sitting outside in the sunshine. She had a dry wit and an infectious laugh. She will be truly missed by her large, loving family. Our sincere sympathy to you Chris and your family, our thoughts and prayers are with you at this time. God bless. Our heartfelt sympathy in your family’s loss. We will forever remember her wonderful sense of humour, her infectious laugh and the many wonderful conversations and games of Kaiser. May all your memories be eternal and give you comfort and peace. SENDING SINCERE CONDOLENCES TO THE PREBUSHEWSKI FAMILY. Sorry to hear of the loss of A.Mary. Shirley and I would like to express our condolences on the passing of your mother, Mary. We never knew her, but heard a few stories that showed admiration for her from her kids and friends. She was lucky to have the legacy of a fine professional career and the love of a large family; Ukrainian at that! Our deepest sympathies with the passing of your mother Mary! Know that we are thinking about your family at this time of sorrow!! 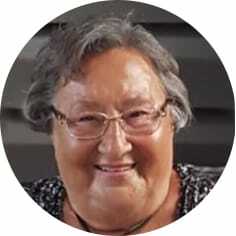 To Mary’s Families… On behalf of the Dietary Department at Pioneer Lodge.. We are sending condolences to all of you in your time of sorrow.. Mary was and always will be a part of our Family here.. We each had a kinship with her over the past years.. Her smile, wit and beautiful spirit always put a smile on our faces.. She will be missed.. We will let our memories of her carry each of us through this difficult time.. We hope you all can do the same.. So sorry to hear of Mary’s passing, please accept our condolences. Sincerest Condolences to all the Prebushewski family. Mary was such a kind soul! So sorry to hear about your mother.My prayers are with you Nick and Chris. Nick & Pam – Our thoughts & prayers are with you and your family during this difficult time. Wishing you peace and strength.